di Bocconi Students Food Association 12 Giugno 2017 8 min. Have you realized Starbucks is actually not the first American giant that intends to sell products invented by Italian people in Italy? The fact is that, a US pizza producer entering this market more than one year ago and is still there till now. We are talking about Domino’s pizza, the US based pizza franchiser. Founded in 1960, Domino’s has now turned into the second largest pizza chain around the world with presence in more than 85 countries and operation of 13,800 stores. The business started from Tom Monaghan and his brother James‘s purchase of a small pizza store named DomiNick’s in Michigan. Its first international store was opened in Canada in 1983, since when rapid expansion to other continents occurred in the following years. With combination of specialization in pizza delivery and successful localization, Domino’s pizza gained popularity in both US and international market. In 2015, the company finally took the challenge to test its capability in the motherland of pizza, Italy. The first presence was a store opened in Milan on 5th October 2015. Before its entering, there’s no precedent of successful major American pizza franchiser in the Italy market, which is featured by a large number of pizzerias down in the street corner and existing fierce competition. To distinguish itself from local competitors, Domino’s Pizza Italy sticks to its focus on delivery model. If you pass by Domino’s stores, piles of pizza boxes along with a few tables are what you could expect rather than well-decorated dinning space. “We have done a pure business thinking and not of flagship. We live in neighborhoods, we are strong in delivery pizza house: our business model is aimed at the home, the door to the delivery of home, with payment by credit card… ” said Alessandro Lazzaroni, CEO of Domino’s Pizza Italy. For food delivery businesses, efficiency without doubt plays an essential role in customer satisfaction especially when it comes to pizza. Just imagine how disappointing it would be when you order pizzas for a party at home with friends but turn out to receive something covered by non-melting, solidified cheese! With years of experience and expert in pizza delivery, Domino’s has not only been capable to provide speedy delivery service, but also allowed customers to track their order online: the order status will be kept up to date with an online application tool named Pizza Tracker. That is to say, the whole process is under monitoring from the moment a pizza is prepared to the second it is sent for delivery. In the most recent survey, it is claimed by Domino’s Italy that the average delivery time per order in the last two months has been shortened to only 21 minutes. Even the most impatient customers will be pleased with it. Except for on-time delivery, another factor contributing to Domino’s great success is its capability in localization. The company adapts product offering to the market it operates in to meet different needs. Menus varied by region. For example, a vegan pizza is provided in Israel where a soy-based cheese is used as substitute of mozzarella. This is also exactly what Domino’s do here in Italy. Aware of the fact that Italians are accustomed to high quality pizzas and particular about ingredients, the company seeks improvements in the whole process of pizza producing to appeal to local customers, from ingredient selection, recipes development to pizza making. 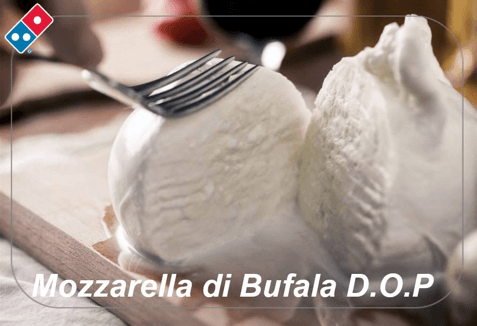 “We’ve created our own recipe, starting from the original pizza recipe, with Italian products, like 100 per cent tomato sauce and mozzarella, and products like prosciutto di Parma, gorgonzola, grana padano and mozzarella di bufala campana”. 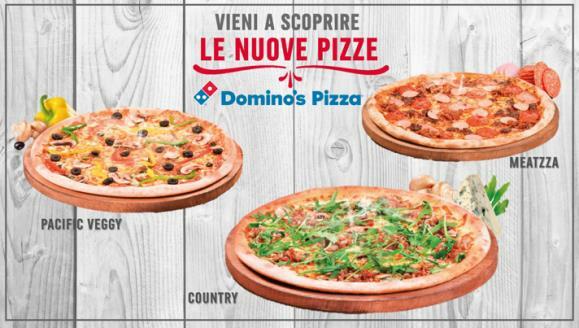 As a result, both traditional Italian pizzas like 4 Formaggi, and American styled pizzas like Hawaiana are provided in Domino’s menu for Italian customers to choose from. Even better, there’s flexibility to create your own pizza and get charged based on toppings selected. To enrich the pizza eating experience, a wide range of side dishes, desserts and drinks are available to order as well, including chicken strippers, potato wedges, cinnamon sticks, and even Haagen Dazs: the American version of gelato. Menu: there are more than 34 millions ways to create a single pizza in Domino. Topping: the most welcomed topping in the US is pepperoni, followed by mushrooms and pepper. Brand logo: the logo in use today has three dots and was first created in 1965. There were 3 Domino’s stores in total at that time, and each dot represented one store. The initial idea was to add a new dot with one addition new store, but was dropped soon as unexpectedly rapid growth of the company. While waiting to see Starbucks’ performance in Milan in the near future, it would be interesting to have a look at how its America peer Domino’s Pizza does during this period. Wondering how the pizza producer combines American service with localized products? Explore more and place an order on Domino’s website or app by yourself!